Let your imagination flow as easily as floating down the Mississippi by choosing a Litchfield Theme Shelter for your park environment. With Litchfield Landscape Elements, you can swim great lengths to create a theme shelter to perfectly meet your needs. This custom Pittsburgh All-Steel Hop End Duo-Top Steamboat Shelter with custom laser-cut lattice and decorative paddle wheel ornamentation will keep all little swimmers afloat. Litchfield features a 10-year warranty on Steel Frame and Litch-Kicker Frame Finish and has 18 all-new standard frame colors (22 in total). For more than 40 years, Cedar Forest Products has been designing and creating shelters for the nation's public parks, camps and recreation facilities. From prefabricated and engineered park pavilions, gazebos, bridges and kiosks to easy-to-build, all-cedar buildings, Cedar Forest Products will work with you from initial concept to the final installation step. Choose from many standard shelter designs or create your own plan to fit your application. Steel or wood, Cedar Forest Products are designed to perform and built to last. The Colorado Yurt Company has been furnishing durable, low-maintenance tipis, tents and yurts to the parks and recreation industry for 30 years. Generous standard features and affordability add value and help budgets go further. Colorado Yurt Company's tipis, tents and yurts are made in Colorado and shipped all over the world. Playing on a playground shaded with PlayTowers is similar to playing under a shade tree—the breathable fabric canopies lower the temperature underneath by 20 degrees while blocking up to 97 percent of cancer-causing UV radiation. 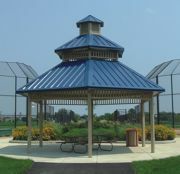 Utilizing existing playground equipment columns, PlayTowers integrate with the equipment—offering safe, obstacle-free shade directly over the heart of the playground. Every standard Apollo Sunguard design is engineered for winds up to 170 miles per hour (120 with cover on) and 5-pound snow loads. The steel frame is available in a powder-coated finish in a spectrum of bright colors. The Vine Street Bench is part of Poligon's new Porter•HuntTM Series of site amenities. This gracefully curved fabric-topped bench is available with jarrah wood or steel slates, a selection of 13 fabric top colors and 28 powder coat colors. 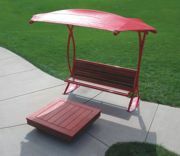 In addition to the Vine Street Bench and the industry-leading lines of all-steel, fabric-topped and wood shelters, Poligon now offers a variety of all-steel or steel and wood tables, benches and trash receptacles, all made in the Poligon tradition of smart design, durability and top-notch quality control. Barrel Roof Pergolas are not for everyone, but they do offer a different look and feel from the norm. This Vixen Hill pergola arrives in modules so it can be assembled anywhere, in only a single day. Best of all, they're made of rot- and insect-resistant Western Red Cedar. Specify with confidence when it's a Vixen Hill Cedar Product. The Festive Frame tent offers a clear span design great for large gatherings. Welded aluminum construction prevents rusting. Waterloo Tent & Tarp Co. simplifies setup and installation, and with the ability to customize designs, the possibilities are endless. The Waterloo sales staff works directly with the customer to find the perfect shade solution to enhance any environment. Pacific Yurts are freestanding, easy-to-install structures that provide year-round comfort and a unique, memorable experience. Founded in 1978, Pacific Yurts designs and manufactures modern yurts, used as cozy accommodations that generate revenue in public and private parks, campgrounds and resorts. Thousands of customers around the world rely on Pacific Yurts' outstanding service and proven product performance. A broad range of options, including installation, 15-year warranted fabric and the ability to add bathroom and kitchen facilities offer value-added convenience. Their flexibility allows them to work as simple cabins, fully furnished luxury retreats or meeting rooms in all climate conditions.